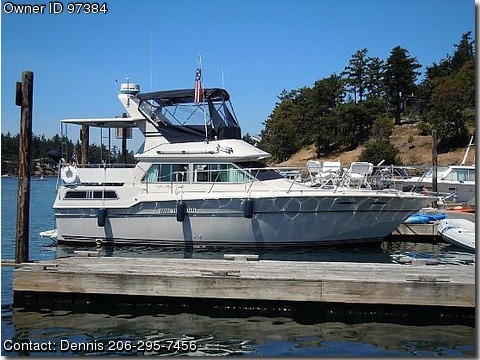 Please call boat owner Dennis at Home Phone: 425-396-0506 or Mobile Phone: 206-295-7456. This boat has been refurbished from top to bottom. Motors have approximately 1,900 hours and are strong. Impellers just replaced in both motors. This boat has a 6.5 KW Westerbeke Genset. Boat is equipped with Garmin integrated 4212 Chart plotter and Garmin 18" HD Radar. Owners have redone all interior accommodations. New carpets, new draperies, new refrigerator, new ice maker, and new salon ultra leather sofa that makes into a double bed. Both forward and aft cabin mattresses have been replaced. 2 VHF, TV/VCR/DVD, 3 batteries, teak floors, H&C water, central vac, auto helm, bilge pump, Coast Guard pack, Dockside power, Windlass with 210' of anchor chain. Fly bridge helm with lower helm option.